“In 1836, Sorel in France took out the first of numerous patents for a process of coating steel by dipping it in molten zinc after first cleaning it. He provided the process with its name ‘galvanizing’." The history of galvanizing starts over 300 years ago, when an alchemist-come-chemist dreamt up a reason to immerse clean iron into molten zinc and to his amazement, a shimmering silver coating developed onto the iron. This was to become the first step in the genesis of the galvanizing process. The story of zinc is closely interlinked with that of the history of galvanizing; ornaments made from alloys that contain 80% zinc have been found dating as far back as 2,500 years. Brass, an alloy of copper and zinc, has been traced to at least the 10th century BC, with Judean brass found in this period containing 23% zinc. The famous Indian medical text, Charaka Samhita, written around 500 BC, mentions a metal which when oxidised produced pushpanjan, also known as ‘philosopher’s wool’, thought to be zinc oxide. The text details its use as an ointment for eyes and a treatment for open wounds. Zinc oxide is used to this day, for skin conditions, in calamine creams and antiseptic ointments. From India, zinc manufacture moved to China in the 17th century and 1743 saw the first European zinc smelter being established in Bristol. In 1742, a chemist named Melouin presented a paper to the French Royal Academy in which he described how a zinc coating could be obtained on iron by dipping it in molten zinc. Interest in Melouin’s discovery spread quickly through scientific circles and the first application was to use molten zinc as a cheap protective coating for household utensils. These products were fairly well known in parts of France during the second half of the 18th century. In 1780, an Italian, Luigi Galvani, discovered the electrical phenomenon of the twitching of a frog’s leg muscles when contacted by two dissimilar metals, namely copper and iron. Galvani incorrectly concluded that the source of the electricity was in the frog’s leg. The term ‘galvanization’ began to appear in the lexicon, connected partly to the work carried out by Michael Faraday. Experiments with dissimilar metals were further pursued by Alessandro Volta, who came to believe that the flow of electrical current was caused by the contact of the dissimilar metals themselves. In 1800, Volta was able to prove this by constructing a stack of alternating zinc and silver plates with a piece of cloth soaked in a salt solution between the individual plates. This device, known as Voltaic pile, was the world’s first battery. In 1824, Sir Humphrey Davy showed that when two dissimilar metals were connected electrically and immersed in water, the corrosion of one was accelerated while the other received a degree of protection. From this work he suggested that the copper bottoms of wooden naval ships (the earliest example of practical cathodic protection) could be protected by attaching iron or zinc plates to them. When wooden hulls were superseded by iron and steel, zinc anodes were still used. ‘Galvanization’ was a term used during the 19th century to describe the administration of electric shocks. In 1836, Sorel in France took out the first of numerous patents for a process of coating steel by dipping it in molten zinc after first cleaning it. He provided the process with its name ‘galvanizing’. It is interesting to note that Sorel was aware of the electrochemical nature of corrosion and the sacrificial role of the zinc coating on the iron. Originally, the word galvanizing did not refer to the process of coating but to the fundamental property offered by this coating. In addition to Sorel’s patent of 1836, A British patent for a similar process was granted in 1837 to William Crawford. 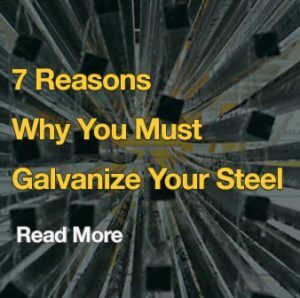 How long has galvanizing been around? By 1850, the British galvanizing industry was using 10,000 tonnes of zinc a year for the protection of iron. This period also saw the invention of an engineered material that would help to embed ‘galvanizing’ into the language of people across the entire globe. One further notable use of galvanized corrugated iron is that of its use during the first and second world wars in the form of Nissen Huts. The idea came to an American born engineer serving with the Royal Engineers stationed at Ypres in 1916. Having experienced problems with lack of billets for soldiers, Lieutenant Norman Nissen envisioned a semicircular form composed of corrugated iron sheets supported on a steel frame. His design would be used throughout both wars creating an indelible link in the English psyche to the material and the hardships connected with war. Galvanized steel is all around us and plays a vital role in our everyday lives. It is used in construction, transport, agriculture, power transmission and everywhere that good corrosion protection and long life are essential. It, for instance, helps light our roads (lighting columns) and provide power for our homes, hospitals and offices (high voltage pylons) There are many other important industries that make use of galvanizing. Just imagine that a new anti-corrosion product is being launched today which offers quick turnaround, off-site application, coverage both externally and internally within hollow sections and a coating molecularly bonded to the steel substrate. Not only that, it self-repairs when damaged, sacrifices itself to protect the base metal, is environmentally sustainable, has good impact and abrasion-resistance and a maintenance-free life of 50 years or more. A coating system with this list of high-tech properties already exists, but the suppositions of many about its price and availability are wide of the mark. Last year more than 600,000 tonnes of steel were protected by this system in the UK and Ireland. It is not a brand new product, in fact, it has been around for over 150 years and, remarkably, it costs less than a good paint system. It is of course, hot dip galvanizing. See how long galvanizing lasts in your area. 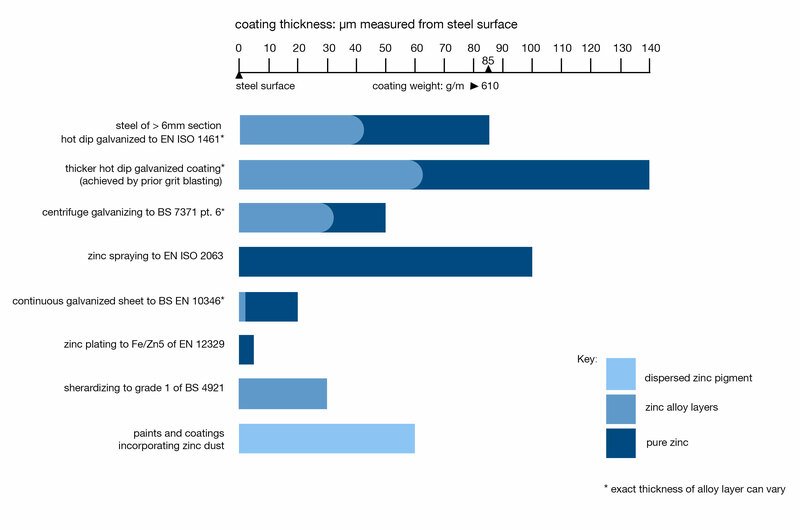 Recent reductions in the aggressiveness of the atmosphere towards zinc, and the stability of costs of applying the coating mean that hot dip galvanizing today costs less and lasts longer! There are more than 60 hot dip galvanizing plants in the UK and Ireland. Zinc – the essential raw material for hot dip galvanizing – is a highly recyclable metal which is vital for human health and ecosystems. See why zinc is sustainable. 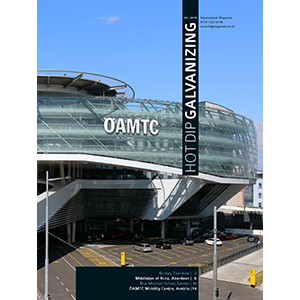 Advancements in metallurgy and furnace technology have improved process efficiency and the sustainable credentials of galvanizing.